In the Oscar race this year, Inside Llewyn Davis sits in the company of important films, long and loud films, high concept films, and so the Coen Bros latest is refreshingly modest, understated, unpretentious and the most honest and humble of the award contenders. It’s perhaps the most invisible of the Coens film too, a filmmaking team known for their bold visual signatures, eccentric characters, verbose dialogue and at times startling violence. 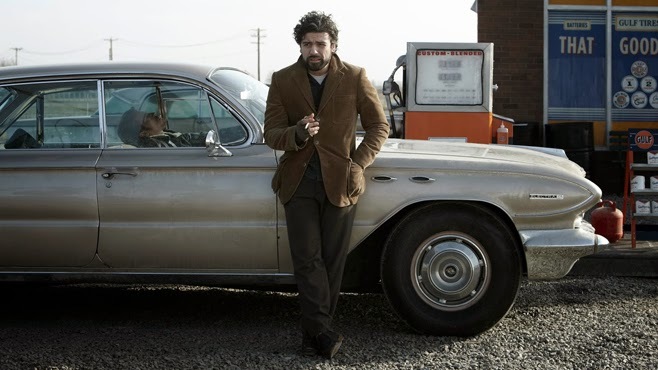 But here the Coens leave their stylish accoutrements behind and revert inward to the angst of their lead character Llewyn Davis, a folk singer in the pre-Dylan era, hopping from couch to couch, trying to score a gig, a session, waiting for his record sales to rise etc,. Davis is a classic Coen creation, an underachieving loner, prickly, slightly pathetic but extremely sympathetic, out of the mould of Barton Fink, Ed Crane (The Man Who Wasn't There), Larry Gopnik (A Simple Man) and likely some version of the brothers themselves before they became extremely successful. The Coens almost completely discards a narrative as well, organizing their story in the tradition of a mythic journey or sorts, but with the rambling discordance of a bumbling vagabond. Davis was probably once a promising artist, one half of a duo, sadly undone by the suicide of his partner. Now Davis as a solo artist is lost with a career aimless and without focus. And yet, his music is perhaps more beautiful and haunting than ever. Such is the fascinating conflict at the heart of the film. Davis’s journey is kicked off by a seemingly insignificant accident, after waking in the morning sleeping on their friends’ couch, Davis mistakenly lets the cat out the door, forced to chase it down and carry it with him for the rest of the film. The cat, a seemingly random occurrence becomes the strange catalyst for Davis’ decent into complete destruction, and a metaphor for his misplaced priorities. His solo record we learn is not selling, an affair with a friend has resulted in another pregnancy, he has no home, thus shamefully moves from couch to couch and at all times justifying his struggle to the naves and cynics along with way. Oscar Isaac is a revelation, performing the sad-sack character with the right kind of prickliness, a man burdened with an emotional pain hinted at in a back-story but conveyed subtly through Isaac’s refined reactions. Among the most memorable moments is a revelation of a past relationship of Davis’ revealed midway through. Isaac’s reaction to this news is startling (not spoiled here) and the stuff of Oscars, but sadly it’s probably too subtle to stick with voters. Just like Davis we can’t help root for this underdog picture, competing for attention beside a devastating indictment of slavery, a monumental survivalist adventure in space, a bombastic Wall Street epic, and other period-set true stories. There was no such person as Llewyn Davis, no political, culture issues to examine, no statement to make whatsoever other than a demonstration of masterful storytelling. There is no picture as deceptively moving or penetrating than Inside Llewyn Davis.